which started me thinking about why, and how, I read blogs. Lets address the "how" first. I don't read blogs through a "feed;" I read them "manually" - which means I pull up the blog to check it rather than being notified of blog updates (okay, I just Wiki-ed that one. I have that little "feed" thing in the right hand column of my blog, but I have never bothered to find out how to use it (grin)). To me, it seems more personal to read a blog by pulling it up rather than through a feed. Yes, I may pull it up to find that nothing new has been posted, but even that is still a "presence of the absence." After a while, I get to know which blogs to look at daily, which weekly, and which only occasionally. And Your Little Blog Too, a recent discovery this summer, had a wonderful post, in July, on Shani Wells (Nancy Sykes in Oliver!) and has only recently begun posting again. I still check regularly. Most people have a blog hiatus when they're busy or traveling, and that's what I assume when posts dwindle or cease. But that's not always the case. Woodsong - Off the Beaten Path was too ill to write earlier this year. Pulling up her blog reminded me to keep her in my prayers. The Bookish Gardener, one of the first blogs I started reading, hasn't posted since July, and only sporadically before that. I say a prayer for her too while enjoying the last flower she posted. And even though Jefitoblog (due to technical difficulties) isn't even currently there, I occasionally try to pull it up because Jason Hare says that Jefito is going to be back eventually. I guess I'm gradually morphing into the "why" of reading blogs. I got totally out of the habit while on vacation/sick. Why get back into it? Why not spend the time reading books instead? Some blogs are for information, and some give me ideas for debate. A number of those are daily reads. Most blogs go beyond that, however. Along with information about politics/education/gardening/music/books/whatever you get a feel for the blogger's personality. You get to like the person writing and look forward to hearing from them. It can get interactive if you post comments, but it can still be slightly interactive even if you don't - i.e., you think up comments but don't post them. My ratio of comments I think to post versus comments I actually post is about 10 to 1. I'll often come up with a comment, maybe even type it in, and then decide that it's not worth bothering with (I'm trying to get over this, but it's hard). And, like any good writer, a good blogger can get you interested in subjects that you don't usually care for. For instance, Everything I Know I Learned From Musicals just reviewed The Jersey Boys, which is a musical about Frankie Valli and the Four Seasons, a group I couldn't stand back in the 70's (I have a difficulty with guys who sing higher than I do!). I read the review anyway. Click here to go to another website to listen to a clip (I only have this song on tape). 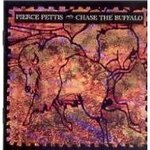 It's from his (sadly-out-of-print-so-I-can't-get-it-on-CD) 1993 album, Chase the Buffalo). Great poem, enlightening thoughts. I wonder how common is your approach to blog-reading. I, alas, don't read much of anything anymore. Either I write or I am conked out on the sofa after a long day, with the nagging thought that there is laundry to do. Ever since younger son was born, my philosophy has been "Life is laundry."